Mercedes has released new details about the G 500 4x4² following a preview earlier this week. 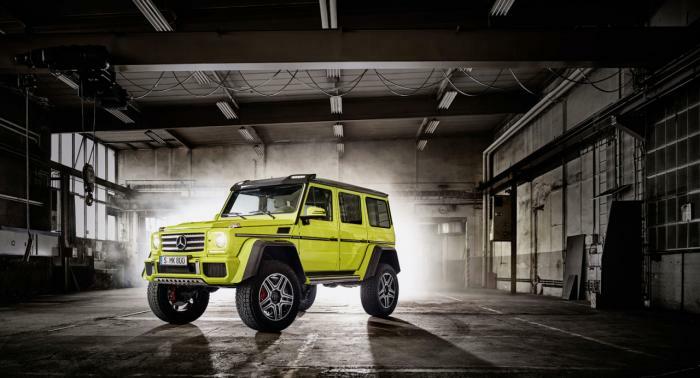 Billed as a "near-series" concept, the model follows in the footsteps of the G63 AMG 6x6 as it features an AMG front bumper, carbon fiber flares and a roof-mounted LED light bar. The concept also has a stainless steel underbody guards, a side exiting exhaust and 22-inch wheels with off-road tires. Mercedes decline to release interior pictures but confirmed the model has designo leather seats with diamond quilted DINAMICA accents. Power is provided by a twin-turbo 4.0-liter V8 engine that develops 422 PS (310 kW). Mercedes was coy on performance specifications but said they used the new engine because it would meet the Euro 6 emission standards. Speaking of performance, the G 500 4x4² has portal axles and a returned suspension with two spring/damper struts per wheel. Mercedes says one spring/damper strut works conventionally with set damper characteristics, while the other has electronically controlled adjustable damping that can be changed from COMFORT to SPORT in just 15 milliseconds. While Mercedes says the model feels like a "sports car rather than a cross-country vehicle," it is immensely capable off-road as it has 450mm of ground clearance, a fording depth 1000 mm and a approach and departure angle of 52° and 54° respectively. A production variant is virtually inventible but Mercedes says the decision will be based on the "reaction which the near-series show car receives."